Naris Niramaiwong (Inset), Banglamung District Chief Officer, chaired a meeting to improve the quality of life for Pattaya-area residents. 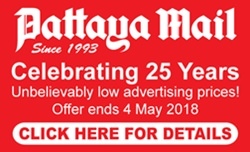 Food hygiene and proper care of the elderly and disabled remain issues detracting from the quality of life for Pattaya-area residents, according to a Banglamung District survey. District Chief Naris Niramaiwong chaired a May 15 effort on the Interior Ministry’s directive to improve the quality of life for Thais ahead of expected elections next year. The order, published earlier this year, called for local governments to launch more outreach services, which Banglamung has already done, running health fairs and meeting with citizens to hear complaints. 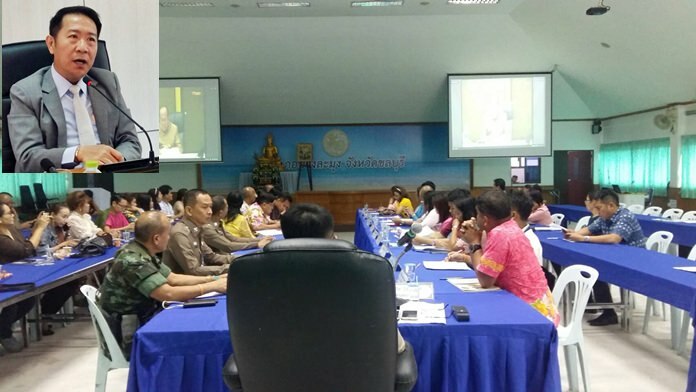 Interior Minister Anupong Paojinda spoke to Naris and other district and sub-district chiefs via video conference the following day to lay the groundwork for the fourth mobile-government outreach, which took place May 16. The next phase is to collate all the public feedback into a development plan to improve overall quality of life. Anupong said the ministry already has collected 720,000 comments from across the country. Naris at the May 15 meeting heard reports on what measures have been completed in the Pattaya area and which remain problems. Food quality, care for senior citizens and the poor, alien labor, garbage and road accidents top the list of items needing attention. Banglamung stands to gain up to 200,000 baht in government funding if its plan can win support from Bangkok.